NASA astronaut Peggy Whitson is set to extend her stay at the International Space Station by another three months. NASA astronaut Peggy Whitson will stay at the International Space Station (ISS) for three months longer than was originally planned, the space agency announced on Wednesday (April 5). The record-breaking spaceflyer, who will command Expedition 51 starting on April 9, will stick around with the Expedition 52 crew instead of returning to Earth with her Expedition 51 crewmates, European Space Agency astronaut Thomas Pesquet and Russian cosmonaut Oleg Novitskiy, in June. NASA and the Russian space agency Roscosmos agreed to extend Whitson's stay at the ISS in order to make the most of Russia's decision to cut one cosmonaut post from its space station crew, leaving an empty seat on the three-person Soyuz spacecraft. If Whitson were to leave with her Expedition 50/51 crewmates, the space station would be left with only five inhabitants instead of the usual six. When the Expedition 51/52 crew, Jack Fischer of NASA and Fyodor Yurchikhin of Roscosmos, arrive at the ISS on April 20, their Soyuz will have one empty seat. Whitson will fill that seat when Fischer and Yurchikhin return to Earth in September. NASA astronaut Peggy Whitson pops out of a cargo bag during a prank on the International Space Station on Feb. 13, 2017. Whitson is poised to continue her record-breaking streak and is just a few weeks away from surpassing NASA astronaut Jeff Williams' record for the most time spent in space by a U.S. astronaut. As of today (April 5), Whitson has spent a total of 514 days in space. Williams set the record in 2016 with a total of 534 days. During a spacewalk last week, Whitson also broke the record for the most cumulative spacewalking time by a female astronaut. She is also the oldest woman to go to space as well as the first woman to command the ISS with Expedition 16. When her fellow NASA astronaut and Expedition 50 commander Shane Kimbrough hands over command of the ISS on Sunday (April 9), she'll become the first woman to command the space station twice. 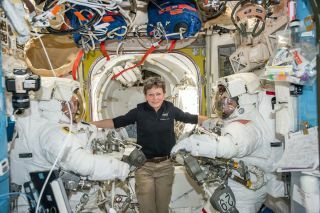 "Peggy’s skill and experience makes her an incredible asset aboard the space station, NASA’s ISS Program Manager Kirk Shireman said in a statement. "By extending the stay of one of NASA’s most veteran astronauts, our research, our technology development, our commercial and our international partner communities will all benefit."